What Christmas Decor is Not Safe for Roofs? Santa’s sleigh and eight tiny reindeer, light-up candy canes, Santa’s legs poking out of your chimney, or “Merry Christmas” in bright, blinking letters spelled out across your roof. There’s no limit to the types of Christmas decorations you’ll see on the roofs, typically starting the day after Thanksgiving. From manger scenes to the entire North Pole, people go all out when they catch that Christmas spirit. It’s hard not to get wrapped up— sometimes literally!—in the festive appeal of twinkle lights or a happy inflatable snowman waving at passers-by. When you’re caught up in the Christmas spirit, the last thing you want to think about is the safety of your roof. However, the festive decor isn’t worth risking damage to your roof and paying for it long after the egg-nog has run dry. Here are a few Christmas decorations that, while festive-looking, are not safe for your roof. What Christmas Decorations Are Not Safe For Roofs? How Do You Decorate Your Roof Without Damaging It? Certain holiday decorations are more suited for roofs than others. A full-sized replica of Santa’s sleigh looks really cool, but it’s not recommended for most homes. That’s because the roof may not be reinforced with the proper weight-bearing structures, and over the course of the sleigh’s stay it can cause damage to the roof. It may not be noticeable at first, but it may result in the need for a new roof later on. Sticking with Santa, there’s a homeowner trend to have his legs sticking up out of the chimney. While it’s pretty cute (sorry, Santa!) it can be dangerous to have anything near your chimney—especially if it’s flammable. A stray ember could float up and even cause a fire. If you really like the look of Santa coming in through the chimney, consider making a faux chimney out of high-quality plastic and attaching it to the other side of your roof. 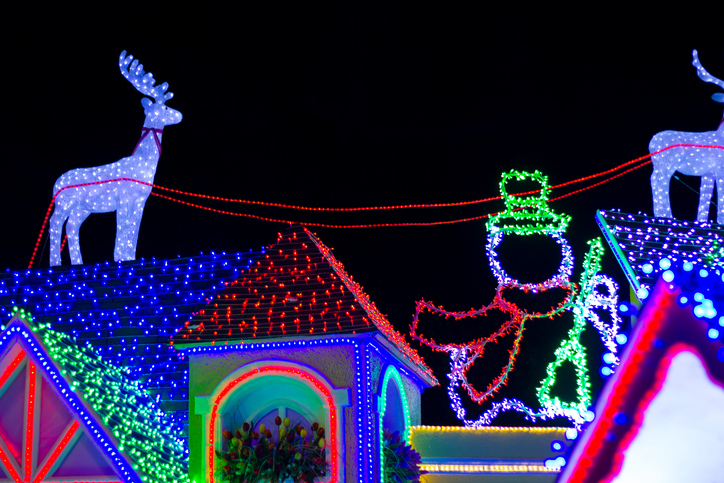 Inflatable decorations and the plastic light-up figures can also wreak havoc on your roof if you’re not careful. That’s because they can be carried away in high winds if not secured properly, which could tear up your roof. That being said, securing your decorations can also cause damage if you use the wrong materials. So far it’s been a lot of bah-humbug, but don’t worry! 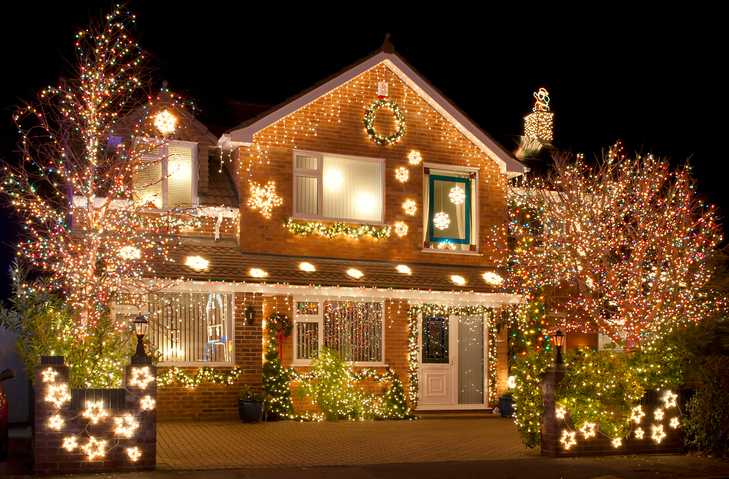 There are several precautions you can take to make sure your roof still looks just as festive! Skip the staples. Stapling anything—lights, ropes to secure Santa, etc—to your roof breaks through the barrier that protects your home from the elements. This means that moisture can get underneath your shingles or in your insulation and makes it easier for mold to grow—not to mention, it makes your home less energy efficient. 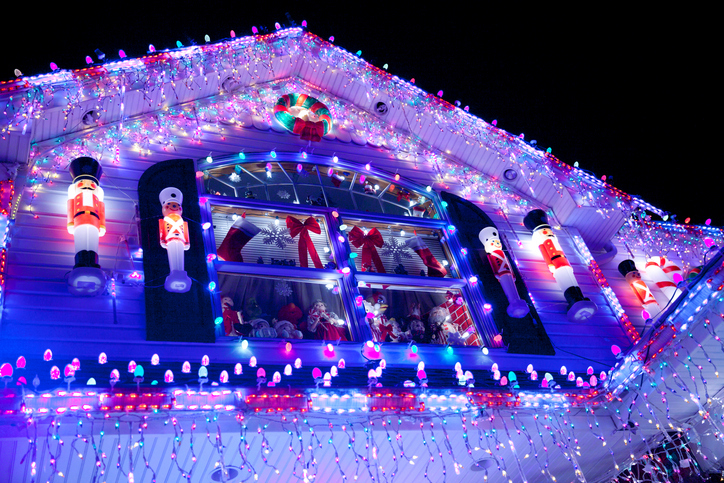 Use plastic clips to secure decorations like Christmas lights to the eaves of your roof instead of staples. In the case of a light-up plastic Santa or Rudolph, you can secure it with sandbags or a bungee cord. Just be mindful that you’re not pulling up shingles or causing unnecessary stress on your roof. Don’t overload your roof. Before you land Santa’s sleigh up there, look into options that don’t weigh as much. Consider a high-quality plastic facade instead. They can be as detailed as you like and weigh significantly less. Consider your lawn. Think about decorating your lawn instead of your roof. You can create a winter wonderland right at your front door, without worrying about potential damage to your roof. Hire a professional to install decorations. If you’re still set on decorating your roof for Christmas, look into hiring a professional. Like you should with any pro, ask for references and ask them if their roof was damaged from the decorations the year prior. If you decide to decorate your roof, there are a few steps to take before you climb the ladder. First, have a game plan before you go up on the roof so you know where you’ll be working and the supplies you will need to get the job done. Second, make sure electrical cords are in good condition—and don’t use any that have been stripped or frayed, or any that have exposed wires. Next, have someone there to help spot you and hold the ladder as you climb. Speaking of ladders, get a sturdy one. Make sure it’s as tall as you need it to be and follow proper ladder protocol…if it says it’s not a step, it’s not a step! And, of course, make sure you’re wearing good shoes for the job—work boots are recommended, but you can wear anything that has a slip-resistant sole. Christmas is a season of festivity and celebration, so have fun with your decorations, but make sure that it’s not at the expense of your roof—or you might end up on Santa’s naughty list.